Do you wanna add a nice twist to your garden? Do you want to make it look more inviting and bright? If the answer of one of those questions is ‘YES’, then you can choose some of the various types of yellow flowers out there. We compiled a list of 35 dazzling types of yellow flowers with pictures. Moreover, we included essential growing information like sun and soil needs. Find out which of these cheery options would fit best in your garden. The yellow roses, also known as the symbol of the good cheer, will surely fill your day with a great dose of sunshine (even when it’s rainy and cloudy outside). Just keep in mind that they will need at least 5 hours of direct sunlight a day. In fact, that counts for all kinds of roses. For sure, the sunflower is one of the most popular yellow daisy type flowers that can be frequently found in solid wedding floral arrangements in fall. It adds spirit to the yard’s ambiance. However, it does not have a strong memorable aroma. 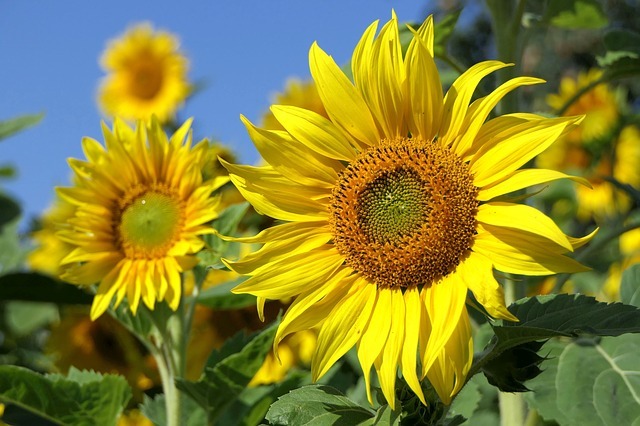 Tip: In reality, the sunflower is one of the toughest yellow flowers types. But still, be aware not to over-fertilize. 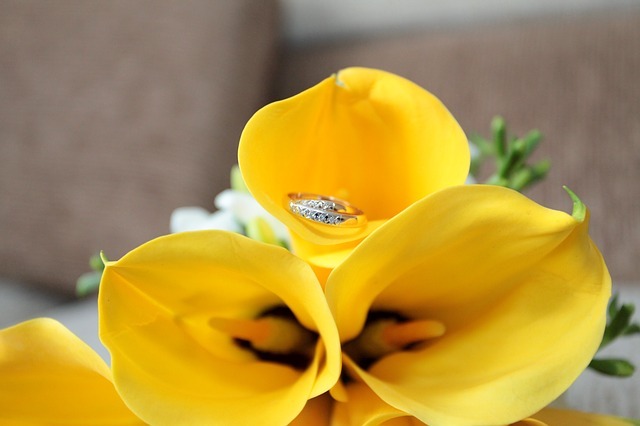 Are you curious about the different types of yellow flowers’ meaning? 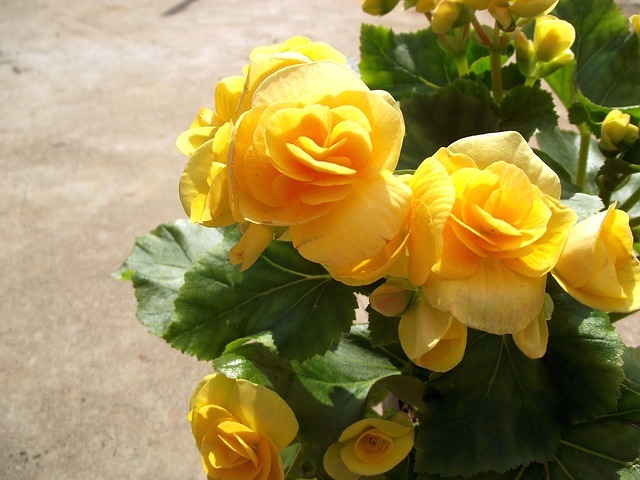 If yes, let me tell you just a few of the various meaning of the gorgeous Begonia! To start, it can be gifted to someone you are very grateful for something; it is also a symbol of peace, harmonious communication, and justice. What is making the Begonia one of those yellow flowers that are hard to forget, is its petals’ buttery color and the rich texture. Tip: Make sure the soil is being moisturized enough, however, do not overwater it. Up to date, there are over 40 wild species of the Chrysanthemum. It is surely one of the most common and loved types of tropical types of yellow flowers. It comes in a huge variety of shapes and sizes. When speaking of its meaning, this bedding plant symbolizes different things depending on the color. For instance, the red one is a symbol of the long life, love, and deep passion. 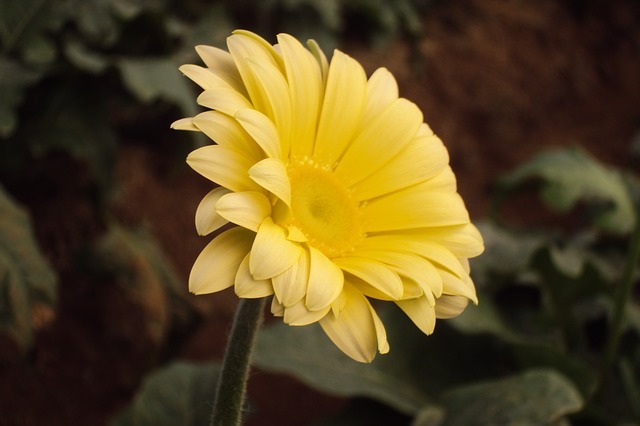 The yellow Chrysanthemum, from the other side, symbolizes sorrow and neglected love. 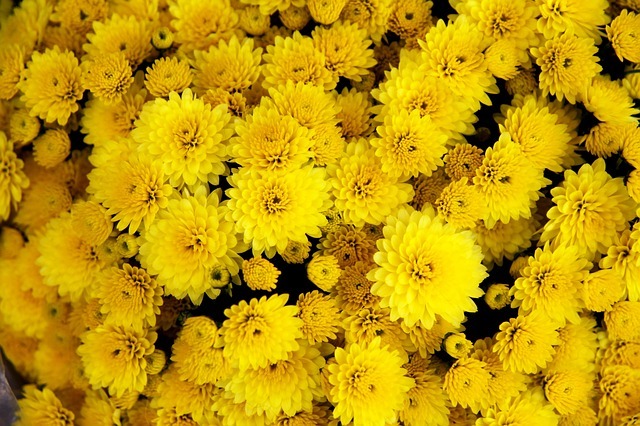 Tip: Read more about the pinching which is the most important techniques for growing Chrysanthemum (or Mum). Marigold is for sure one of the most splendid annual yellow types of flowers for watching. However, its smell is quite peppery and some of you might find it disagreeable. Besides, it is able to bloom all summer long so your garden will sparkle even during the hot summer days. Tip 1: Make sure you are allowing the soil to dry before watering again. 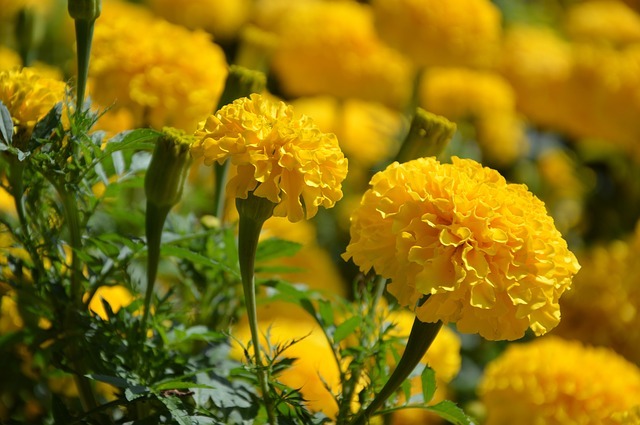 Tip 2: Give your Marigold lots of direct sunlight. The Pansies are one of the most popular types of small yellow flowers. It is great for creating borders and ground covers in the garden. It is loved for its charm, adaptability, and sweet aroma. Some of the key meanings of the Pansy (Viola Wittrockiana) are free-spirit, loving thoughts, remembrance. 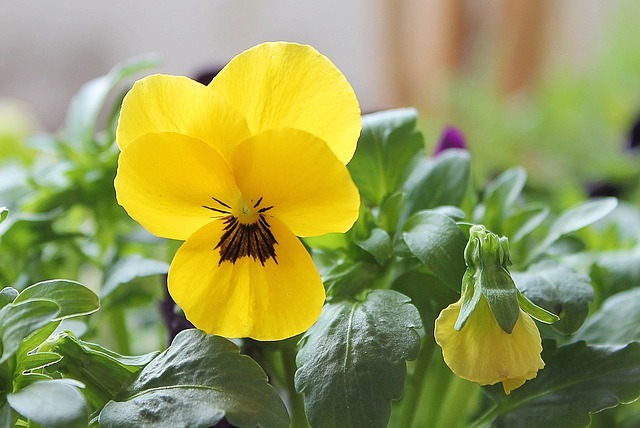 The yellow Pansy symbolized the love and affection of one person to another. Tip: Make sure you are watering your Pansies on a regular basis. The drought is the main threat for them. Calla lilies originated in South Africa, are very easy to cultivate perennial bouquets types of yellow flowers. Thanks to the arrowed-shaped foliage, they are very impressive and elegant without a doubt. Their main advantage is the quick blossoming which comes only 5 to 8 weeks after planting. They should be planted any time between February and June. Tip 1: Do not overdose the water, Calla lilies do not like soggy soil. Tip 2: Do not display on a direct light. 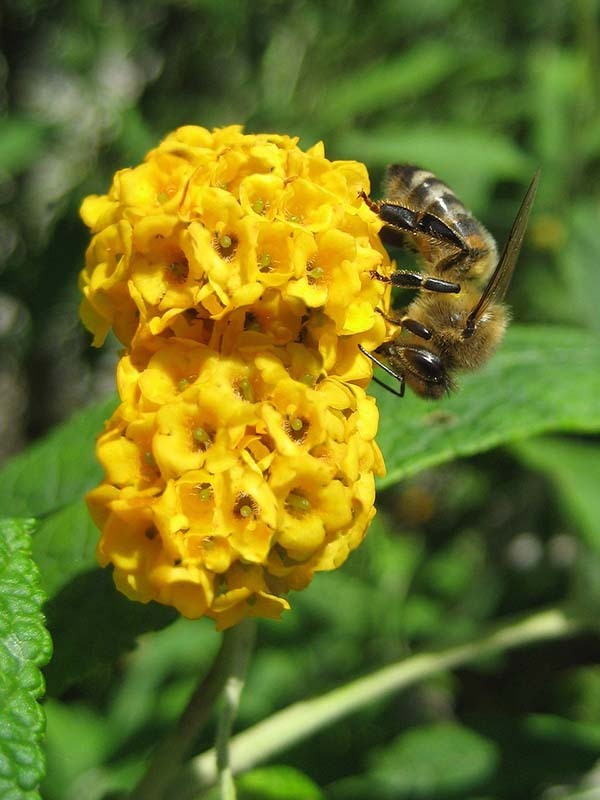 Do you want to plant some small yellow flowers that need minimal care? Then, choose the Black Eyed Susan! 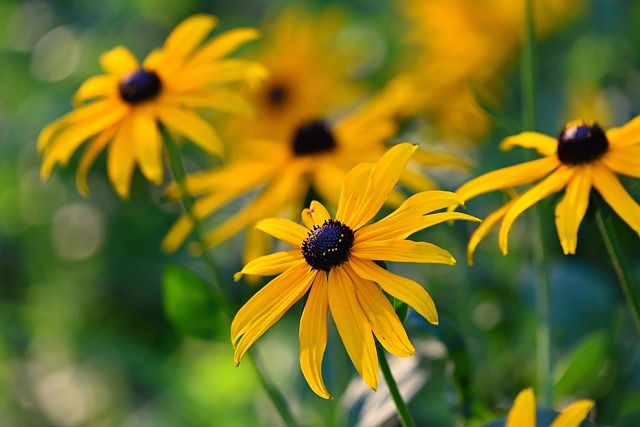 These yellow daisy type flowers are able to cheer every garden. They match well with annuals and shrubs. They are flourishing from the end of June until the beginning of the frosty winter. Tip: Leave an adequate spacing between the plants and water at soil level rather than watering from above. 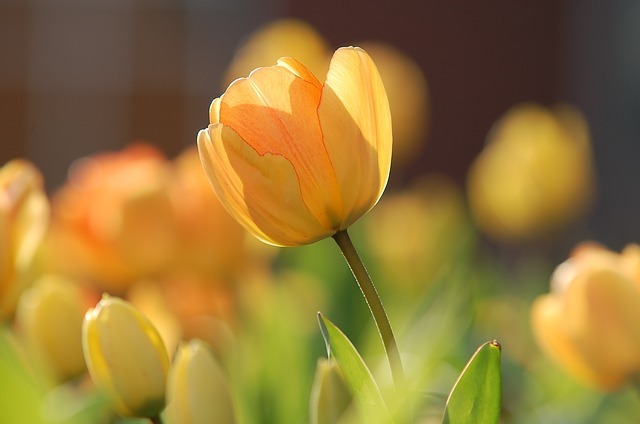 The tulips are tall yellow flowers that are able to attract small birds and gorgeous butterflies into your garden. The most suitable time of the year to plant them is usually during September and October in the north and October and November in the south. The meaning of the yellow tulip has progressed somewhat, from once symbolizing the hopeless love to now being a popular expression for sunshine and positive thoughts. Tip 1: Tulips hate the excessive amount of water, so do not overdose if you want to enjoy them. Tip 2: The best way is to plant them in full sun or partial shade. The bloom of the yellow version of the jasmine is just as alluring and fragrant as the other colors’. In fact, the name of this flower means ‘a fragrant oil from Persia’. It flowers from the beginning of April until the mid-May. Perfect for any garden that needs a little twist! 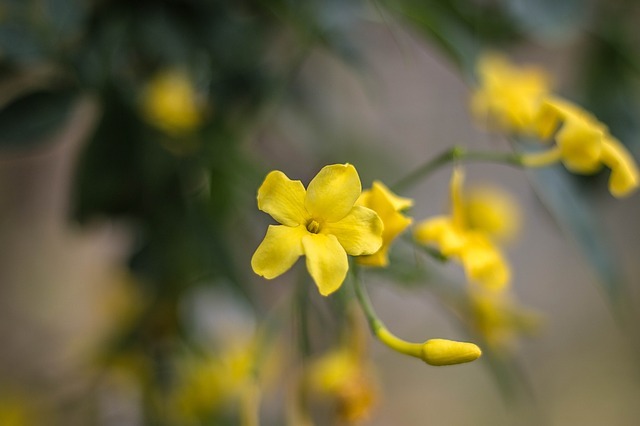 Some of you might not know but the jasmine is one of the most poisonous yellow flowers on Earth. The body of every person People poisoned by Yellow Jasmine become fully paralyzed yet remain conscious with eyes open. 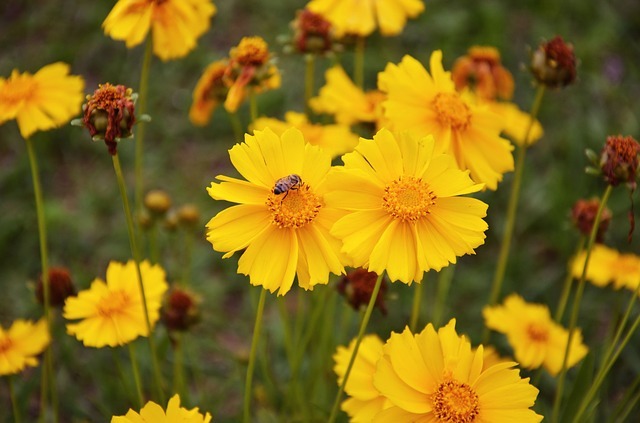 The Coreopsis, also known as Tickseed, are clump-forming, tall yellow daisy type flowers. The delicate and bountiful blooms will make your garden one-of-a-kind! The Tickseed blows best in full sun but it can also grow in partial shade. If Deadheads are taken off, this flower will be the longest lasting bloom in the garden, trust me! The Yellow lilies are coming in different shapes and sizes. Their symbolic meaning is joviality…and in case you decide to plant some of them in your garden, they will surely brighten your day. Plus, they are never dormant! 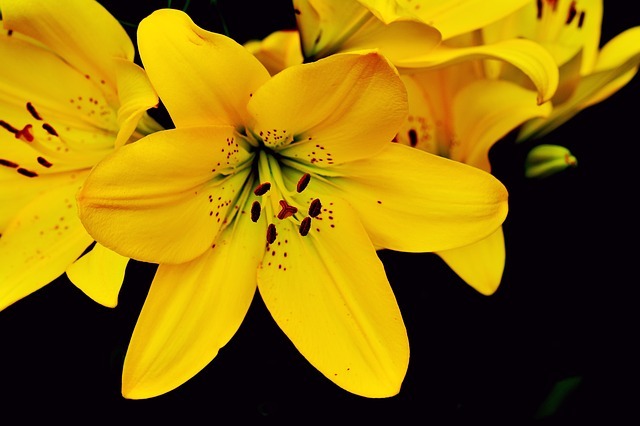 Keep in mind that Yellow lilies, along with the other types of lilies don’t require watering on a daily basis. However, make sure to water them deep enough to reach the bulb. Besides, skip out on the strong high-nitrogen fertilizers. 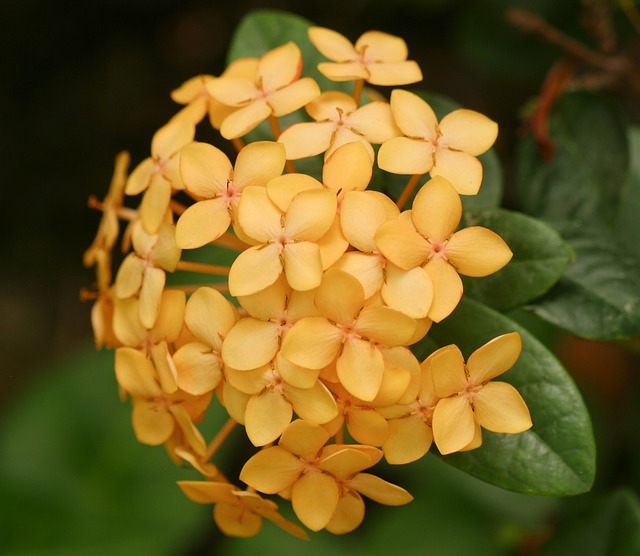 This flower is commonly called “Yellow star” due to its one-of-a-kind large buttery blossoms in yellow. Believe it or not, Dahlia goes to the group of the various types of cactus with yellow flowers. Their successful planting requires lots of direct sunlight and light shade during the extremely hot summer days. It starts blooming from mid-July until frost. 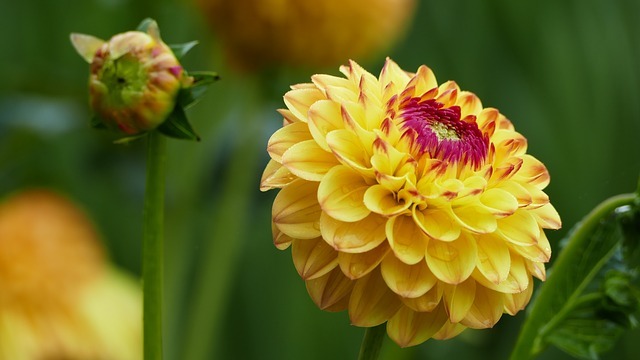 The Yellow Dahlia is as beautiful displayed in a vase as planted around the house. Fun fact: both dahlia flowers and tubers are able to be eaten. The tubers taste like a cross between a radish and a potato. 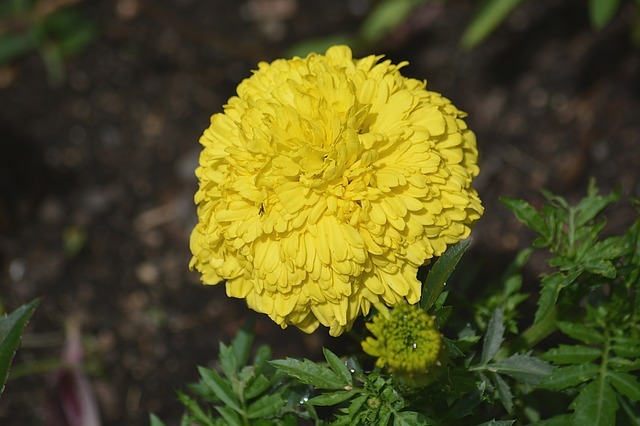 The Yellow carnation falls in the group of the most commonly-planted types of yellow annual flowers. They are coming in different colors and each of them has a totally different meaning from the other ones. For instance, the Yellow carnation symbolizes disappointment. The pink one means “mother’s love”, while the red carnation symbolizes admiration. As stated in a Christian legend, those flowers first appeared on earth as Jesus carried the Cross. Carnations sprang up from where the Virgin Mary’s tears fell as she cried over her son’s pickle. When it comes to planting, make sure to keep the soil very moisturized. Also, the carnation’s foliage should not be exposed to the direct heat, however, the plant surely needs some hours of full sun every day. Someone might say that Daffodils are quite funny yellow flowers as they look like a trumpet. Their blooms are a certain sign that the spring has arrived! They can easily grow both indoors and outdoors. 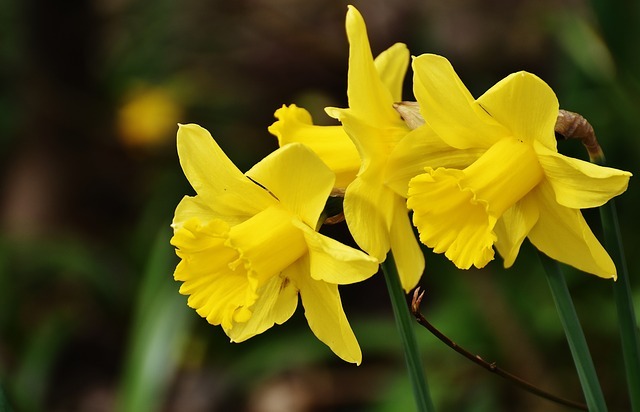 If you have an animal at home, be careful as the Daffodil is very poisonous to pets. Besides, they are one of the most suitable types of yellow flowers for a rustic wedding as they are both unpretentious and splendid. Tip: Make sure you are planting bulbs that are not already dried out. Also, the Yellow daffodil needs to be planted about 3 times deeper than its bulb’s height. If not, the plant will curve soon after blooming. These oddly looking, slightly fragrant yellow flower types are usually starting to bloom from the beginning of April until the end of June. Keep in mind that this period will last longer in a colder climate. 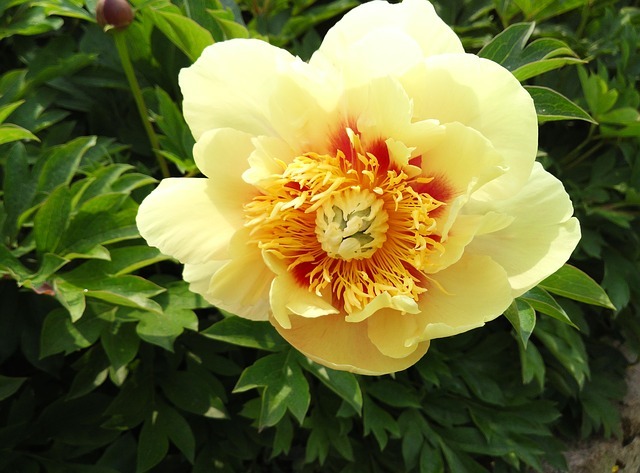 Make sure the soil is well-drained as the standing water will kill the Yellow peonies very fast. 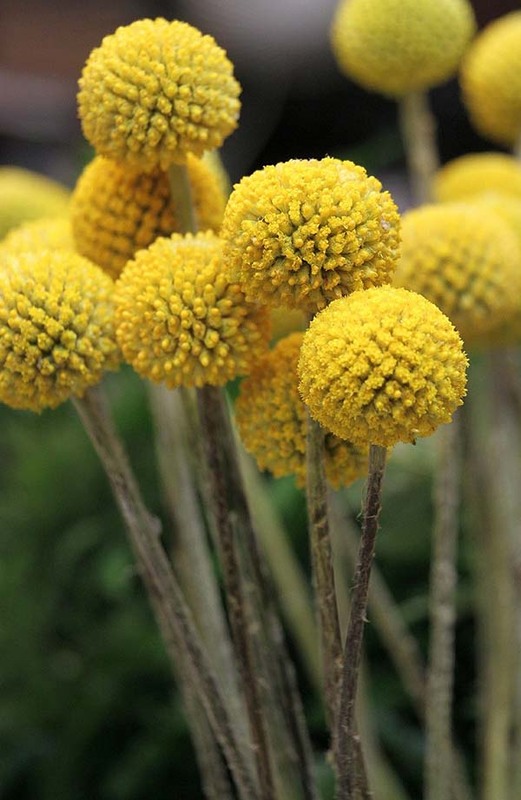 The cute Billy Balls, also knows as woolly heads, are perfect yellow flowers for gardeners looking for low-maintenance plants. They bear with most soil types, do not require constant watering, and are principally pest and disease resistant. Exposure to the direct sunlight is recommended, at least 6 six hours of direct sun helps the plant to bloom extensively. Originally from Australia, the Craspedia belongs to the daisy family. It symbolizes the good health. (Yellow) Daisy, the 5th most common flower in the world, is basically composed of white petals and a yellow center but is coming in a wide variety of colors. Daisies are delicate, long-lasting, perennial yellow flowers. Moreover, they do not require a lot of maintenance but a solid dose on direct sunlight. I have searched for the symbolic meaning of the yellow daisies and it is cheerfulness. 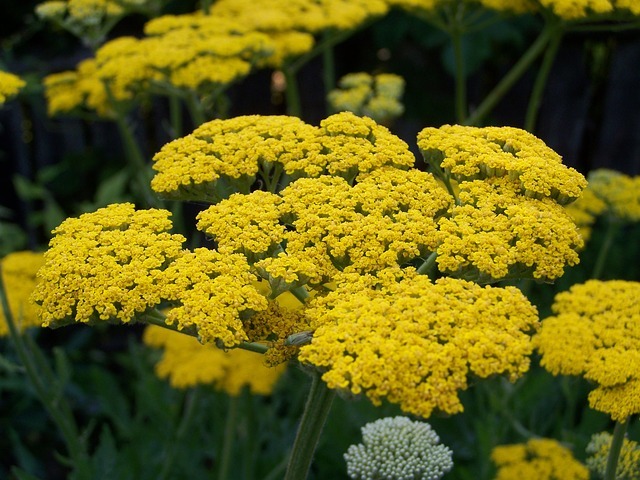 I am a big fan of the Yellow Yarrow as it is an ancient aromatic herb with tons of healing properties! It is helping to reduce heavy menstrual pain, to lower high blood pressure, and to improve the circulation in the body. As a matter of fact, Yarrow was found amongst other medicinal herbs in a Neanderthal burial site in Iraq, which dates from around 60,000 BC. 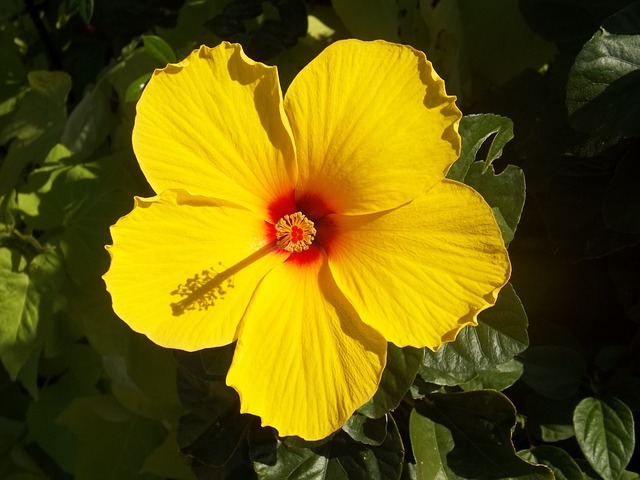 Talking about interesting types of yellow flowers, the Yellow Hibiscus is an eye-catching flowering shrub (can grow up to 30 feet high), originated from Hawaii. Its Hawaiian name is ‘maʻo hau hele’ which literally means “green traveling introduced hibiscus”. It is a symbol of friendship and platonic love. This tropical flower is sensitive to both drought and cold. Make sure they are regularly moist and preserved from temperatures below freezing. 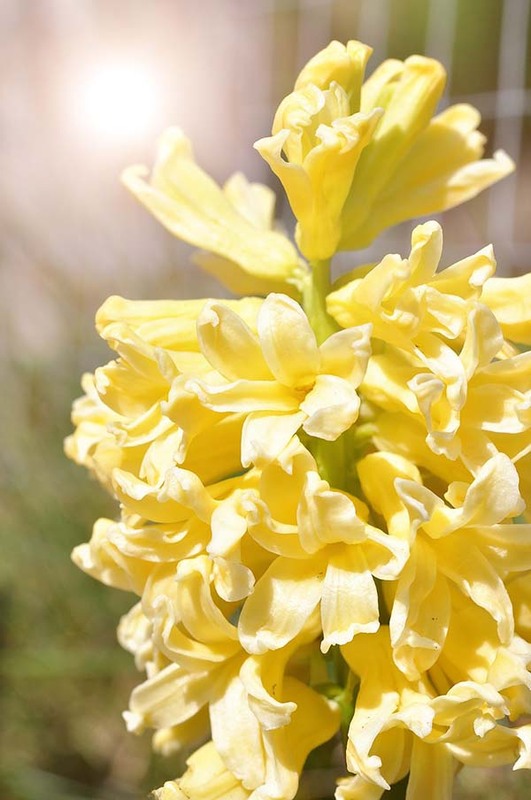 The Hyacinth, also known as the “Yellow Queen”, is a splendid perennial that could be a great choice if you want to refresh your garden. It looks amazing planted in a combination with all types of yellow flowers. The Yellow Queen comes in a wide variety of colors and each of them has a different symbolic meaning. The yellow one, for instance, symbolizes the jealousy, while the blue one (the most popular one) stands for sincerity. 💡 Plant the bulbs in fall, 4-inches deep. Note: Keep in mind the fresh bulbs of the Hyacinth are very poisonous and could irritate the skin. Zinnias, or Yellow Ruffles, are surely the most popular yellow flowers. You can create a true rainbow in your garden by combining various colors of Zinnias, from flaming red to baby pink. Those flowers are fast growers. After the big frost, you can directly sow them during the early spring. Then you can seed the second batch in mid-summer, to have fresh new plants blooming into the autumn. Those types of yellow flowers do not have just one meaning but many such as thoughts of friends, courage, daily remembrance, generosity, and lasting affection. 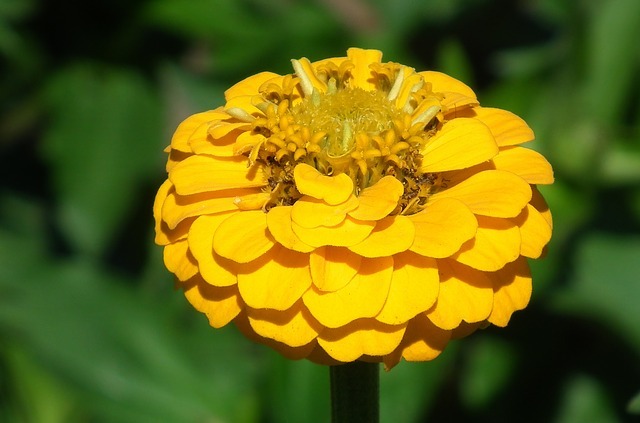 Tip: Yellow Zinnias are rather easy to grow annual flowers. Remove dead heads to ensure continued blooming and fertilize slightly. 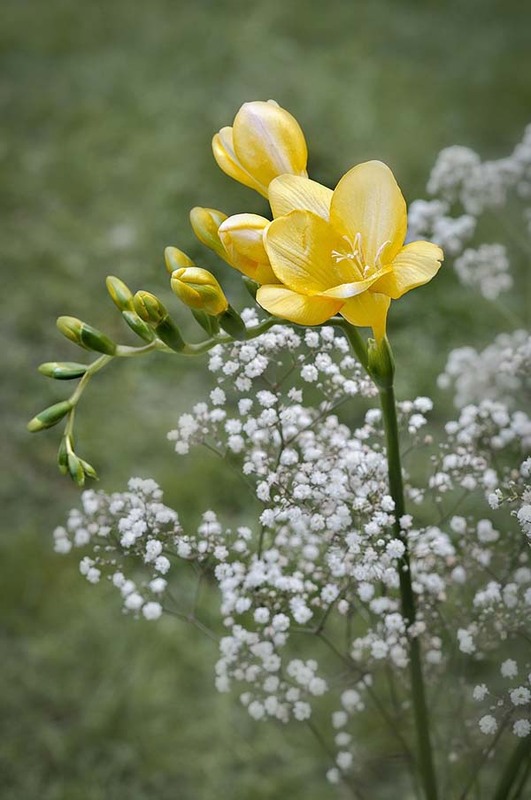 Yellow Freesia are elegant types of yellow flowers that open in the morning. They originate from South Africa and stands for innocence and friendship. They can grow both indoors and outdoors, however, keep in mind they prefer dry summers and winter temperatures above 20F. Knowing when to plant the bulbs is the key to success. If you are living in a warmer region, you can plant them in the autumn. If the climate in your region is cooler, then plant bulbs in the mid-spring. Goldenrod, or Solidago, is one of those types of yellow annual flowers that have strong healing properties and several health benefits. It is a natural diuretic and anti-inflammatory. Besides, it is not the most typical garden flower. 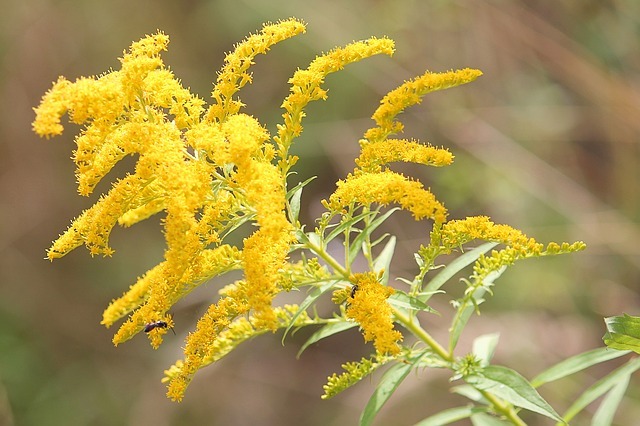 The blossoms of the Solidago attract a lot of insects, the most pleasing to people being colorful butterflies. The blooming starts at the end of the summer and continues until mid-fall. Goldenrod needs well-drained soil and a solid amount of full sun. 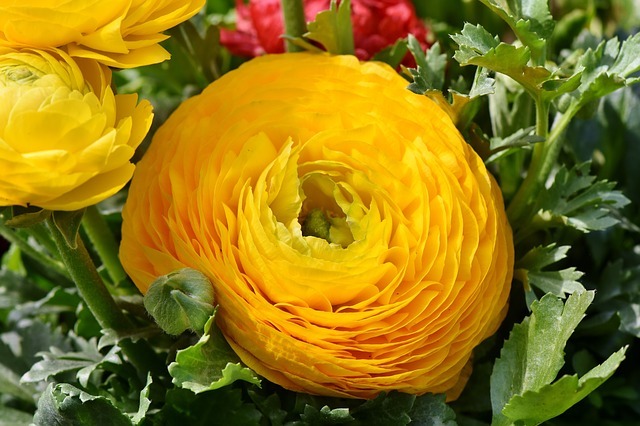 Yellow Ranunculus, originating from Asia, is also known as Buttercup and Coyote’s Eyes. This plant is celebrated for its various healing features. Further, Buttercup comes in different colors and each color carries a specific symbolic meaning with itself. Yellow ranunculus, for instance, stands for radiant charm. This flower is ideal for those who want to express their affection to their partner. The Buttercup’s blooms are full of petals. Make sure to provide a well-drained soil. Compared to all different types of yellow flowers names, the Yellow Butterfly Bush is my most favorite one! It is a late summer bloomer that has bright yellow blooms with an orange center and rounded edges. Vivid color is accented with silvery, tight foliage. This eye-catching shrub can grow 8 feet high, producing long thorns of solid colorful blooms. The plant is drought -tolerant and prefers direct sun rather than shady spots. Awesome cut flower! And as its name implies, butterflies love these blooms! Yellow Primroses (Oenothera) are native to North America. Fragrant and flashy, they are short yellow flowers that come in a rainbow of hues and may stand 3 inches high to over 2 feet high, depending on the sort. 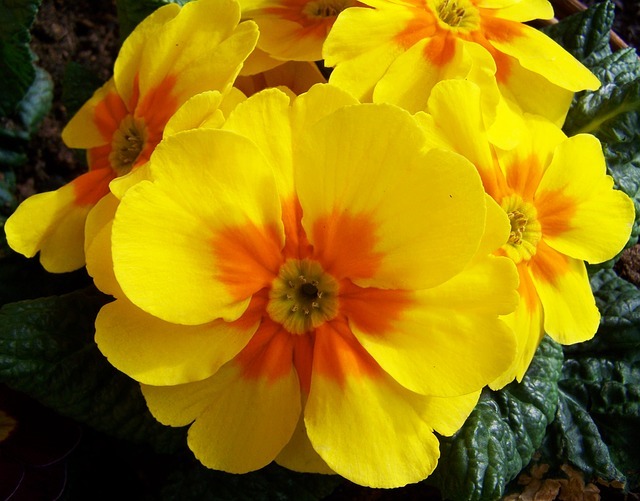 The formula for successful growing of primroses is partial shade + cool weather + moisturized soil (similar to the one for growing almost all different types of yellow wildflowers). Continuing the list of yellow flowers types, here comes the Yellow Snapdragon, also knows as lion’s mouth, calf’s snout and toad’s mouth. Basically, it’s a perennial plant that varies in size from 5 inches to 3 feet tall and needs well-drained soil and direct sunlight. It origins from southern Spain and North Africa. 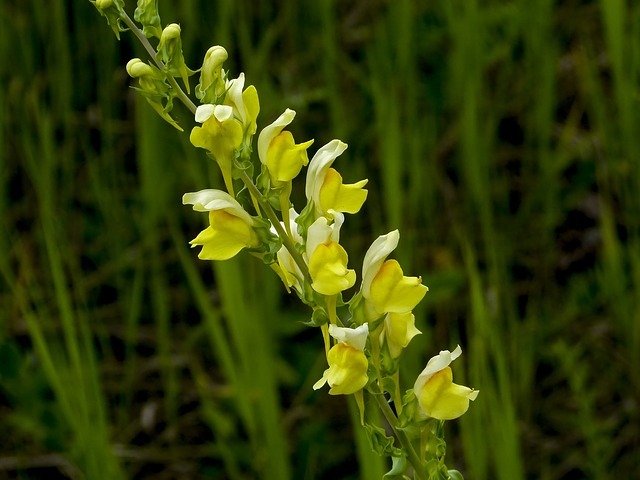 Similar to other yellow flowers, the Yellow Snapdragon has a very complex analogy. From one side, this flower symbolizes inner strength in difficult circumstances. On the other side, snapdragons are being used as a charm against falsity. 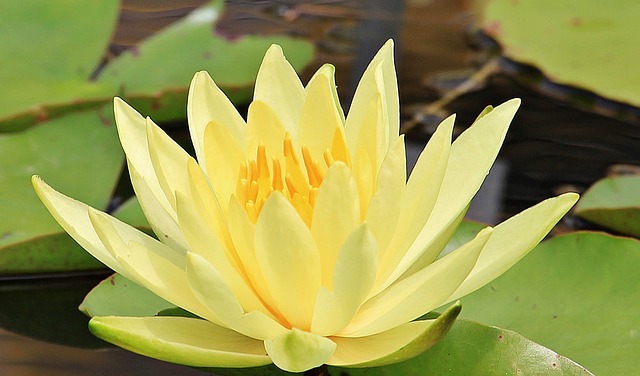 Yellow water-lilies are perennials with strong rootstocks and both immersed and floating oval foliage. This splendid flower prefers full sun, however, it can grow successfully in partial shade. Their blooming period is between mid-June and August. The Prickly Pear, often named nopal, is one of the popular perennial treelike types of cactus with yellow flowers. It grows up to 18 feet (5.5 m) height. The fruits of this plant are widely used for fighting diabetes, high cholesterol, obesity, and hangovers. 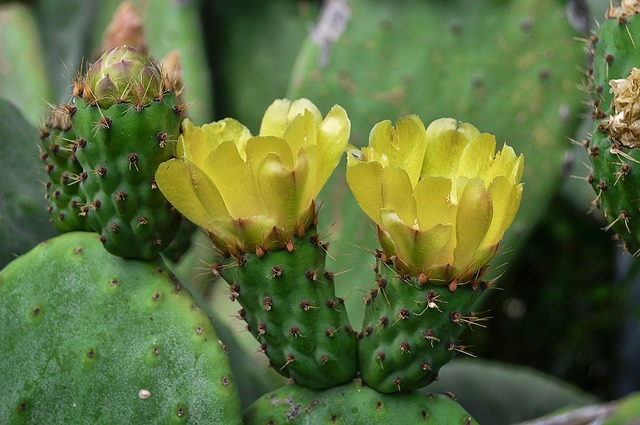 The Prickly Pear is also promoted for its antiviral and anti-inflammatory features. This species needs full sun and warm climate so make sure you are living in an area with suitable conditions for growing the exotic nopal. Here comes another stunning yellow plant, the Iris flower! Natively from Europe, it is named after the Goddess of the rainbow. 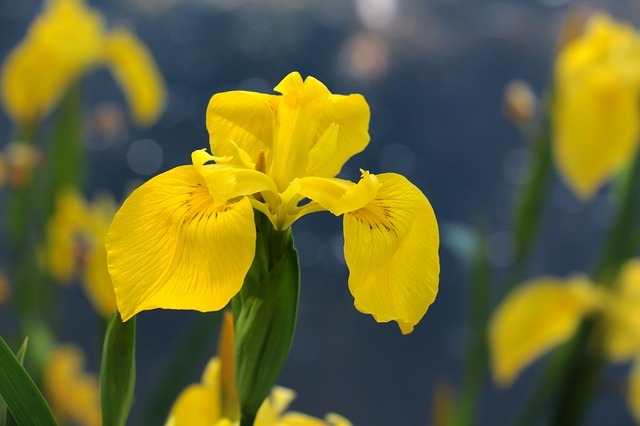 Up to date, the world knows about 100 varieties of Yellow Iris. It is a herbaceous perennial that blooms from late summer until the late fall. The iris would be an ideal addition to borders, flower beds, bushy city gardens, and cottage yards. It stands for passion and was often used by Victorian suitors to display their depth of feelings. 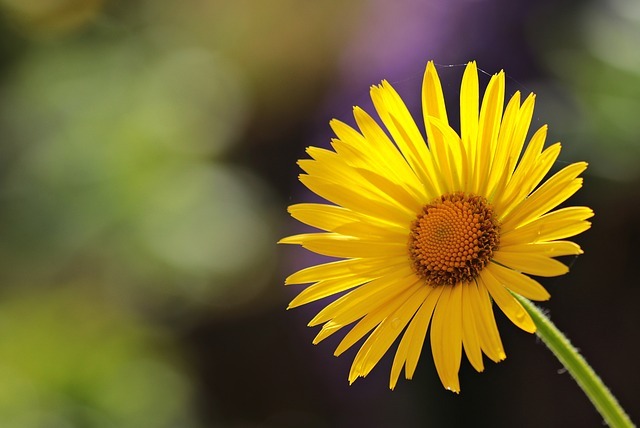 The Yellow Gerberas are appreciated perpetual yellow flowers not only for their phenomenal beauty but also for the belief that they radiate colossal bliss. They have originally come from South Africa and fall in the group of the yellow daisy type flowers. They are often reaching heights of 8 to 24 inches. Similar to the other kinds of flowers and plants, each color of the Gerberas has a different meaning. For instance, the vibrant yellow color stands for friendship and happiness. Important: Gerbera daisies need full sun and well-drained soil. Compared to the majority of yellow types of flowers, the Perennial Geranium is extremely easy to grow. A moderate fertile, well-drained soil and a solid amount of direct sunlight is everything that is needed. These flowers have a peppery smell, seed easily and have a long blooming period from early summer to early fall. I was very surprised to find out that there are more than 300 of species of geraniums that differ in size, shape, and color. When speaking of symbolic meanings, the most common ones of the Perennial Geranium are gentility, true friendship, and melancholy. The Yellow Hellebores, also known as a Yellow lady, is a beautiful perennial winter flowering plant that needs full sun (but also can successfully grow in partial shade). The Yellow lady stands for calumny and scandal (quite negative meaning compared to the rest of the yellow flowers we have talked about so far 😐 ). 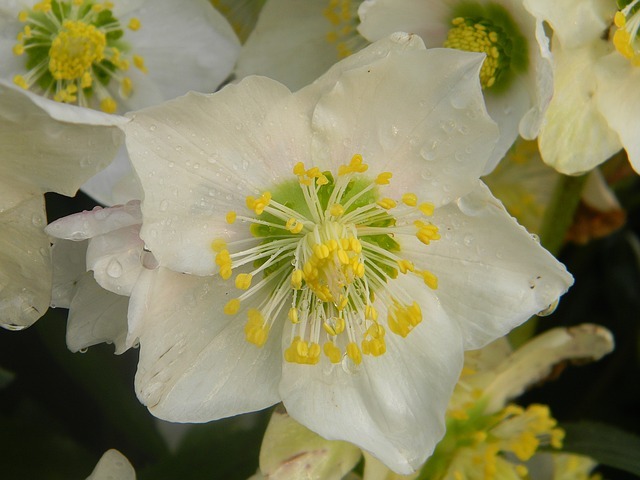 Note: It can surely make a splendid flower cut but keep the following in mind – all parts of the Yellow Hellebores can be very toxic if ingested and can provoke eye and skin irritation. 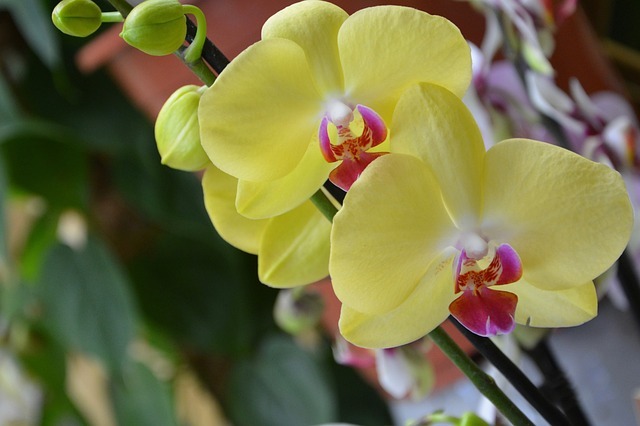 The Yellow Orchids are of the most popular perennial decorative yellow flowers that come in a wide variety of sizes. They stand for fertility, majesty, and greatness. In ancient Greece, orchids used to symbolized virility. Moreover, Greek women believed that if the father of their expected child ate large, fresh orchid tubers, the baby would be a boy. Due to their enormous elegance, these bright colored flowers are being used for wedding and ceremonial decoration. 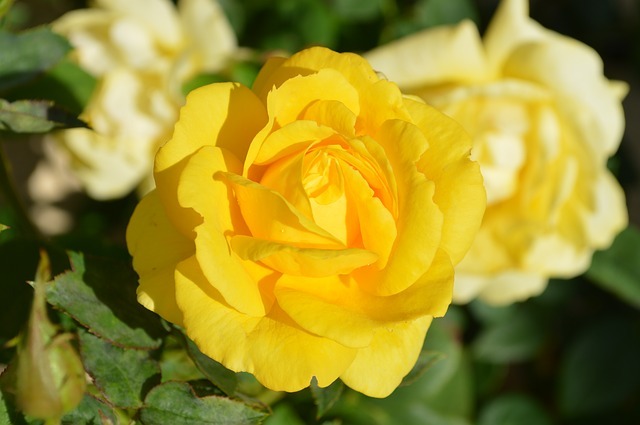 So now that you are familiar with the symbolic meanings attached to the most popular yellow flowers, it makes planting flowers all the more mindful. Enjoy the natural beauty and spread positive vibes by gifting a yellow flower bouquet to your dear ones.